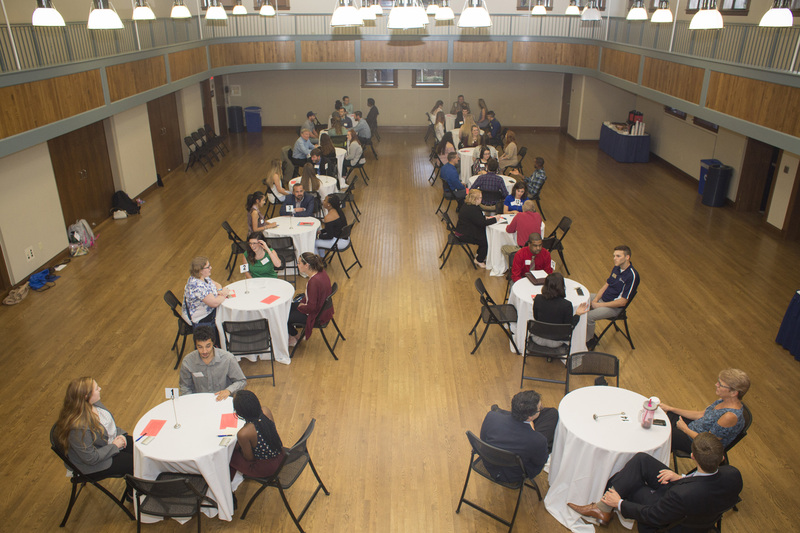 A group of 13 professionals and 33 students filled Dorsey Gym for Columbia College’s annual Speed Networking event Sept. 26. 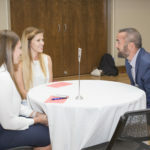 Orvil Savery still has vivid recollections of his job-hunting days: fidgeting in a chair as the interviewers look over your resume, holding your breath in anticipation of the next question, palms sweating more than you thought humanly possible. 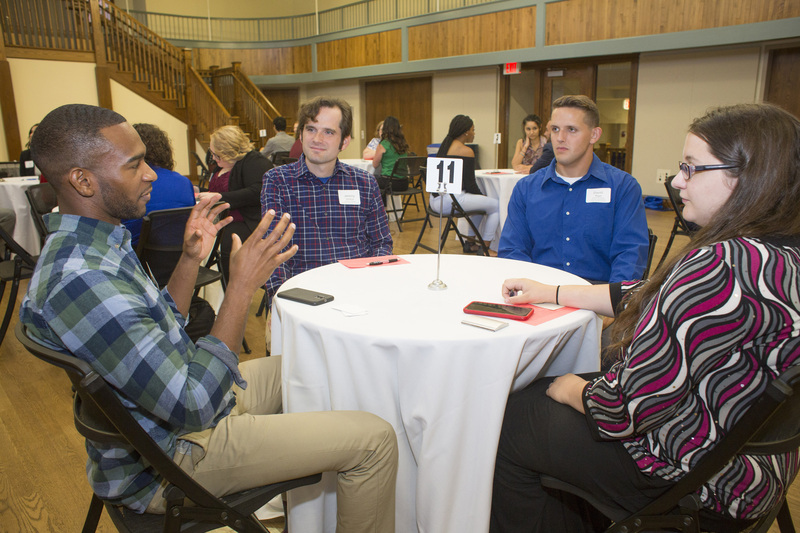 Now that he’s on the other side of the table as a human resources generalist and diversity recruiter at Veterans United Home Loans in Columbia, he tries to make the process as painless as possible. He’s got a go-to joke for these situations. 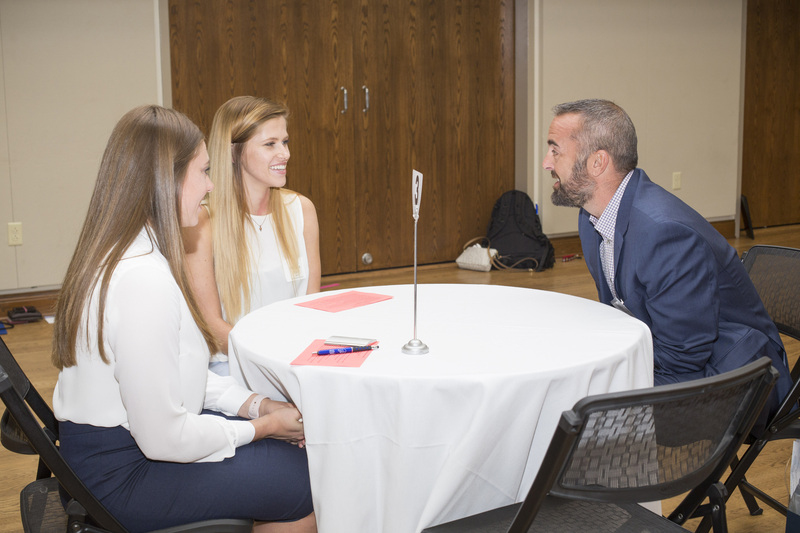 Savery was one of 13 professionals to participate in the fall Speed Networking event September 26, all of whom used a variety of icebreaking tactics to help put the 33 Columbia College students who cycled through their tables at ease. 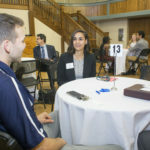 Each group of two or three students got seven minutes with a professional before it was time to move to the next table. But if the students at the event were nervous, they didn’t show it. 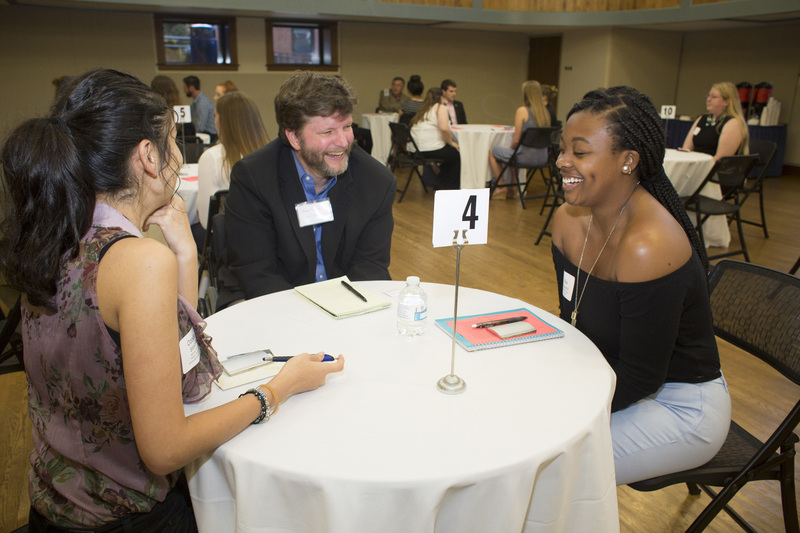 They all were well prepared with resumes, business cards and questions. 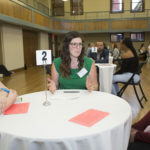 The event, a collaborative effort between Columbia College’s Alumni Relations office, the Grossnickle Career Services Center and Nationwide Insurance, started off with a dinner seminar for students with tips on how to conduct themselves in an interview setting, as well as the gift of a business-card holder and the opportunity to have professional portraits taken for free. 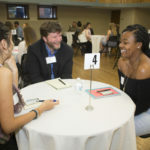 Columbia College will also be holding speed networking events at its Lake of the Ozarks (November 8) and Jefferson City (November 14) locations this fall. 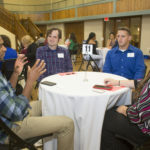 Seven alumni returned to the main campus event to donate their time and insight to current students: Judson Ball ’07, Chris Bass ’15, Mitch Gosney ’13, Larry McDaniel ’03, Jerome Rader ’79, Taylor Schulte ’16 and Jim Yankee ’04. 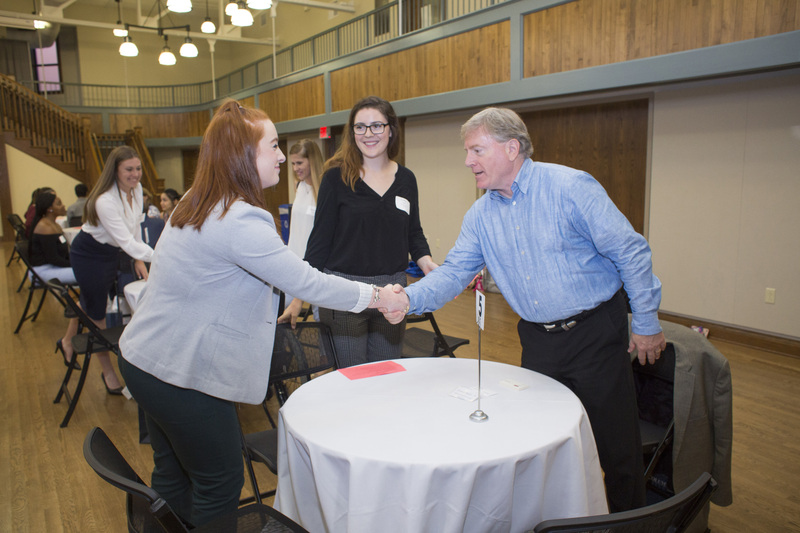 Once the students met the professionals in Dorsey Gym, it was off to the races. Chingarande also attended the event as a freshman last year. He and fellow sophomore Abigail McCracken, an elementary education major, made the rounds together this year. 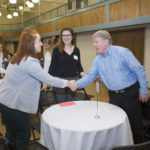 Aside from the pizza joke, Chingarande got to hear from Savery about the multiple summer internships Veterans United offers for students with communications and marketing backgrounds. 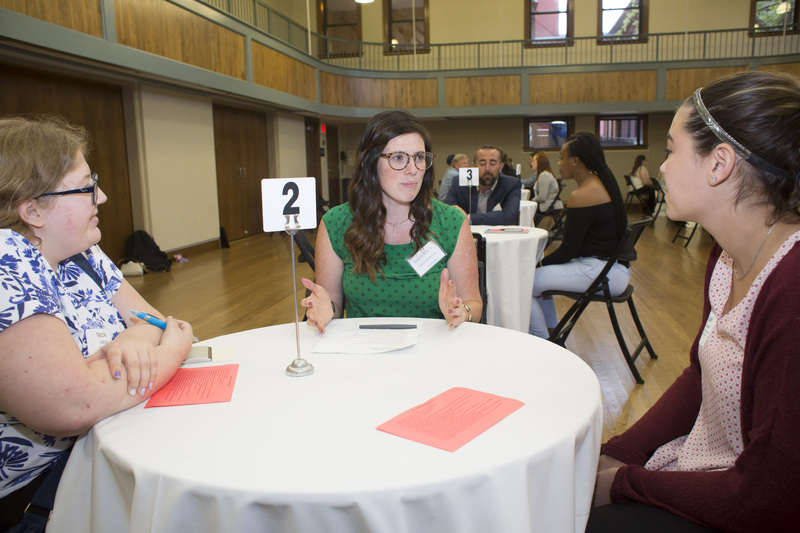 McCracken said she attended the event because it was “highly encouraged” to her and the rest of the Emerging Leaders Institute (ELI) members, and she thought the lessons learned would be useful for the future. 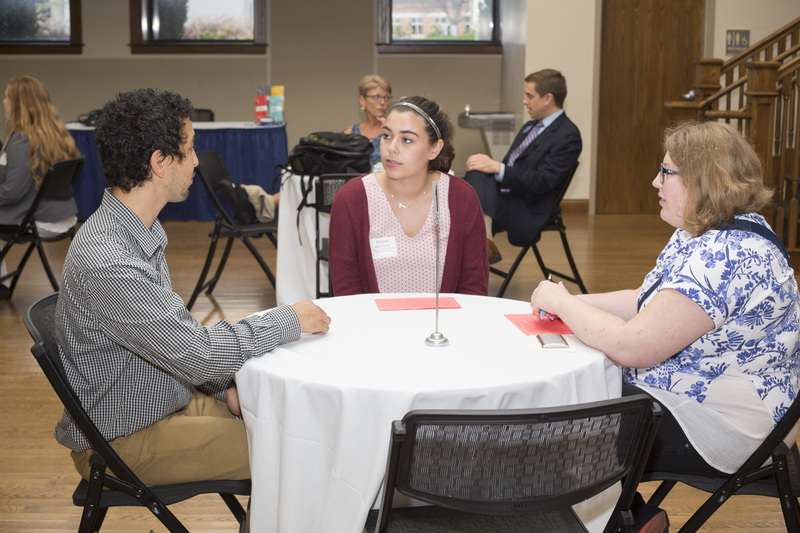 She had an especially fruitful discussion with Cassidy Urie, a sixth-grade math teacher from Jefferson Middle School. Senior Austin McBee, another attendee, is a member of ELI as well. 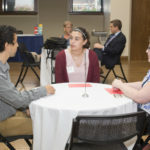 He is a biology and secondary education major, and his ELI “vision project” deals with access to food and nutrition education for children who have “food insecurity,” meaning they don’t have reliable access to enough affordable, nutritious food on a daily basis. 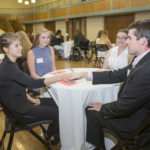 Through Speed Networking, he made connections with three people who can help him find resources for his project: Urie, to connect with local educators; McDaniel, founder and CEO of the Coyote Hill children’s home, to connect him with local children in need; and Spence, whose company helps promote events, with portions of the proceeds going to charity. 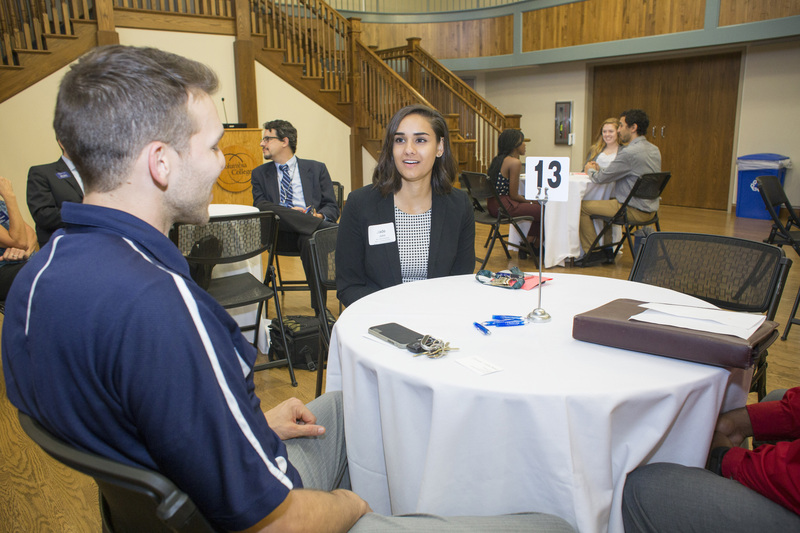 One student, Lance Petre, even scored an internship with Rader and MBS Textbook Exchange after meeting him at Speed Networking. 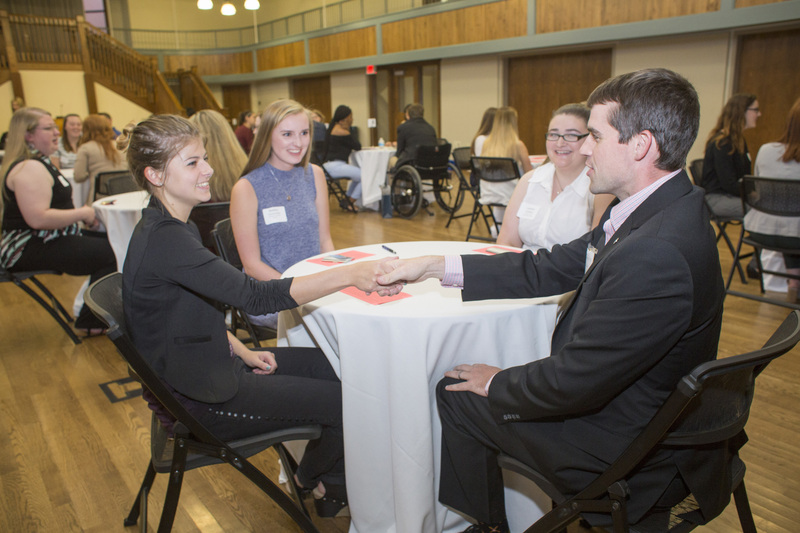 Check out a photo gallery from the Speed Networking event below.